EPA recently launched the Clean Power Plan (CPP), a comprehensive program mandating reductions in GHG emissions from large existing sources, including power plants, and potential new sources of GHGs. The CPP is rooted in Section 111 of the Clean Air Act, which lays out distinct regulatory approaches for new and existing sources of emissions. Section 111(b) covers federal programs to address new, modified, and reconstructed sources by establishing emissions standards. Section 111(d) mandates a series of state-based programs covering existing sources; under Section 111(d), EPA establishes guidelines and the states then design programs that fit within those guidelines to achieve target emissions reductions. The New Source Rule under the CPP was published in the federal register on October 23, 2015. The regulations take the form of “New Source Performance Standards” (NSPS). Under the CPP, EPA is finalizing NSPS that for the first time will establish standards for emissions of CO2 for newly constructed, modified, and reconstructed fossil fuel-fired generating units. This action establishes separate standards of performance for fossil fuel-fired electric utility steam generating units and fossil fuel-fired stationary combustion turbines. These standards also address related permitting and reporting issues. The final rule sets separate standards for new power plants fueled by natural gas and coal. New natural gas power plants can emit no more than 1,000 pounds (lbs) of CO2 per megawatt-hour (MWh) of electricity produced, which is achievable with the latest combined cycle technology. New coal power plants can emit no more than 1,400 lbs CO2/MWh, which almost certainly requires the use of carbon capture, use and storage (CCUS) technology. CCUS is a technology that may capture up to 90% of the CO2 emissions produced from the use of fossil fuels in electricity generation and industrial processes, preventing CO2 from entering the atmosphere. Furthermore, the use of CCUS with renewable biomass is one of the few carbon abatement technologies that can be used in a “carbon-negative” mode, actually taking CO2 out of the atmosphere. CCUS is a multi-stage process in which potential CO2 emissions are captured from a power plant instead of being vented into the atmosphere. CCUS consists of three parts; capturing CO2, transporting CO2, and securely storing CO2 emissions underground in depleted oil and gas fields or deep saline aquifer formations. EPA has established certain regulatory requirements for demonstrating the permanent underground storage of CO2. The requirement that new coal plants install CCUS technology will drastically reduce its emissions. Increased deployment of CCUS technology at power plants will very likely drive CCUS costs down and make it a more viable option at other new coal plants. Through experience and innovation, CCUS costs may come down enough to be viable on new natural gas power plants, or as retrofits on existing coal plants, to reduce carbon dioxide emissions from the power sector even further. New natural gas plants can reach the final CO2 standard by employing efficient generation technology. In older steam turbine plants, natural gas is combusted to heat water, which creates steam to turn a turbine and generate electricity. These plants have thermal efficiencies of 30-35 percent, meaning about one third of the chemical energy stored in natural gas is converted to electricity. In contrast, new combined cycle combustion turbines take advantage of the energy in natural gas to operate with a thermal efficiency above 60 percent. New coal plants, on the other hand, cannot achieve the final standard through efficiency alone. The most efficient type of coal plants, using ultra-supercritical boilers or integrated gasification combined cycle technology, can currently achieve a CO2 emission rate of around 1,700 lbs/MWh. Therefore, new coal plants can only meet a standard of 1,400 lbs CO2/MWh through the use of CCUS, which can capture a significant portion of a power plant's potential emissions. Certain proposed CCUS power plants are aiming to capture nearly 90 percent of potential emissions, which translates into an emissions rate of potentially less than 500 lbs CO2/MWh. Even if EPA were not moving forward with this standard, very few new, greenfield coal plants are likely to be constructed in the U.S., in part because of the availability of affordable natural gas. The Energy Information Administration lists only four potential coal plants between now and 2018, compared with more than 200 expected natural gas plants. The final CPP rule for new power plants would likely be layered on top of existing state programs. For example, a new plant operating in a RGGI territory, including Maryland, would have to achieve the final federal standard, and would also have to submit tradable emission allowances annually to comply with the requirements of RGGI. The federal provisions of the CPP (Section 111(b)) vests relatively more authority in EPA, and is more straightforward than the state-based provisions (in Section 111(d)) described below. EPA is required to find emission reduction technologies that have been adequately demonstrated and use these to set federal, numerical performance standards that new power plants must meet. These standards are implemented by the states, as are most EPA air rules, but states do not have much flexibility to alter the standards set by EPA. On the other hand, under Section 111(d), states have greater flexibility in how they implement the EPA standard. For instance, as outlined below, the state-based program allows for the possibility of market-based mechanisms to reduce emissions system-wide, rather than focusing on individual power plants. The CPP under Section 111(d) of the Clean Air Act was released by the EPA on August 3, 2015 as a “Common sense approach to cut carbon pollution from power plants” and was published in the federal register on October 23, 2015. The CPP was developed to reduce CO2 emissions from affected fossil fuel-fired (coal, oil, or natural gas) generating units by 32% from 2005 levels of CO2 from “affected units” in the U.S. power sector. An affected unit is defined as one in operation or that had commenced construction on or before January 8, 2014, has a generating nameplate capacity above 25 MW capable of selling greater than 25 MW of electricity, and has a base load rating >250 MMBtu/hour heat input of fossil fuel; and any stationary combustion turbine that meets the definition of either a combined cycle or combined heat and power combustion turbine. In the CPP, EPA has determined the Best System of Emissions Reduction (BSER) that has been demonstrated for carbon emissions from a particular group of sources by examining technologies and measures already in use to reduce CO2 from fossil fuel-fired power plants. Under the CPP, the BSER is a set of measures, or “building blocks” and guidelines to be used by states to develop state system plans that reflect the state’s actual generation system and fuel mix. In determining the BSER, EPA considered the ranges of reductions that can be achieved at affected generating units at reasonable cost by application of the three building blocks, taking into account how quickly and to what extent the measures encompassed by the building blocks could be used to reduce emissions. Building Block 1: Improved efficiency at power plants. Power plants can make heat rate improvements to reduce the amount of CO2 they emit per megawatt-hour of electricity generated by increasing the operational efficiency of existing fossil-fired power plants. Building Block 2: Shifting generation from higher emitting coal to lower emitting natural gas power plants. This building block reduces the carbon intensity of electricity generation by shifting electricity generation from higher emitting fossil fuel-fired steam power plants (generally coal-fired) to lower emitting natural gas-fired power plants. Building Block 3: Shifting generation to zero-emitting renewable. The final BSER analysis does not include existing or under-construction nuclear power or existing utility-scale renewable energy generation as part of building block 3, but instead takes into account recent reductions in the cost of clean energy technology, as well as projections of continuing cost reductions. Generation from under-construction nuclear facilities and nuclear plant uprates can still be incorporated into state plans and count towards compliance. In fact, nuclear power competes well under a mass-based plan, as increased nuclear generation can mean that fossil fuel units are operating less and emitting fewer tons of CO2. In assessing the BSER, EPA recognized that power plants operate through broad interconnected regional grids that determine the generation and distribution of power, and thus the Agency based its emission and reduction analysis on the three established regional electricity interconnects: the Western interconnection, the Eastern interconnection, and the Electricity Reliability Council of Texas interconnection. Maryland is located in the Eastern interconnection region. In determining state-specific goals, EPA made use of regional average emission factors paired with individual state-specific generation portfolios. Building Block 3 includes increases in renewable energy for states to meet their GHG reduction targets. 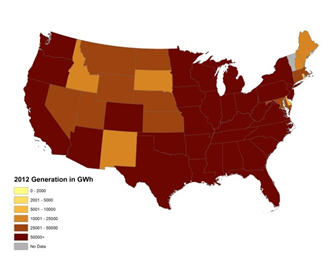 Figure 5-4 shows EPA’s projections for renewable energy in 2030 compared to 2012 generation. 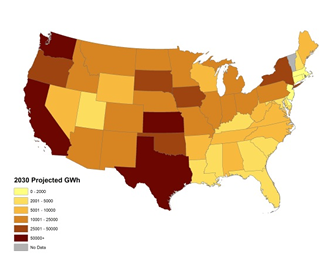 As illustrated, the future for growth in renewable energy varies from state-to-state, depending in part on the status of existing renewable energy projects in these states. While EPA’s projections and proposed goal show Maryland and its power plants will need to continue to work to reduce CO2 emissions and take additional action to reduce its goal in 2030, these rates are designed to be met as part of the grid and over time. In fact, Maryland’s goal reflects the inherent flexibility in the way the power system operates and the variety of ways in which the electricity system can deliver a broad range of opportunities for compliance for power plants and states. The CPP establishes state-specific interim and final goals for each state, based on the baseline average emission rates for the region and the states mix of power plants. States may meet either EPA’s specified mass-based goals, which are an absolute tons of carbon emission reduction required or rate-based goals which are an intensity based emission rate expressed in terms of lbs of CO2 per MWh of power generated. Whether rate-based or mass-based, there are many subtle elements or options that need to be considered to construct a workable, equitable, and economical implementation plan. These include consideration of options for allocation of allowances and offsets, renewable measures, load growth and accounting for energy efficiency. States that use the mass-based goal must assure that carbon pollution reduction from existing units achieved under the CPP do not lead to increases in emissions from new sources. EPA is offering an option to simplify this requirement for states developing plans to achieve mass-based goals. If a state chooses this route, its state planning requirements are streamlined, avoiding the need to meet additional plan requirements and include additional elements. States can use EPA’s model trading rules or write their own plan that includes trading with other “trading ready” states, whether they are using a mass- or rate-based plan. Under current CPP guidelines, states electing to show compliance with a mass-based approach can only trade with other mass-based states. The same is true for those states choosing to take a rate-based approach. “Emissions banking and trading” provisions have been used extensively in mass-based emission budget trading programs. Banking programs generally reduce the overall cost of attaining more stringent emissions limitations. Banking encourages additional emission reductions in the near-term if economic to meet a long-term emission rate constraint, which may be beneficial when there are social preferences or other reasons to achieve environmental improvements sooner rather than later. It is also beneficial when addressing pollutants that are long-lived in the atmosphere, such as CO2, and where increasing atmospheric concentration of the pollutant leads to increasing adverse atmospheric impacts. If employed by a state, emission budget trading programs, including RGGI, must be submitted as part of the state Plan. Other measures in the CPP encourage implementation of pollution reductions and increased investment in clean energy prior to mandatory reductions that begin in 2022, resulting in “glide paths” to compliance, rather than “cliffs.” Mandatory reductions beginning in 2022 and the phase-in of BSER measures between 2022 and 2029 eliminate the “cliff” and enable states to chart their own individual emissions reduction trajectories or “glide paths.” The glide path gradually steps down the amount of carbon pollution per megawatt-hour generated. The performance rates are phased in over the 2022-2029 period, which leads to a glide path of reductions separated into three “interim step periods”: 2022-2024, 2025-2027, and 2028-2029. States may elect to set their own milestones for interim step periods as long as they meet the interim and final goals articulated in the emission guidelines. States must define their interim step milestones and demonstrate how they will achieve these milestones, as well as the overall interim and final goals. All state goals fall in a range between 771 lb/MW-hr (states that have only natural gas plants) to 1,305 lb/MW-hr (states that have only coal/oil plants). A state’s goal is based on how many of each of the two types of plants are found in the state. Maryland’s 2030 rate-based goal is 1,287 lb/MW-hr, which is on the high end of the range; therefore, Maryland has one of the least stringent state goals, compared to other state goals in the final CPP. The step 1 interim goal for Maryland is 1,644 lb/MW-hr which provides a smoother glide path and less of a cliff at the beginning of the program. Maryland’s mass-based goal is 14.3 million tons by 2030, with a baseline of 20.1 million tons in 2012. 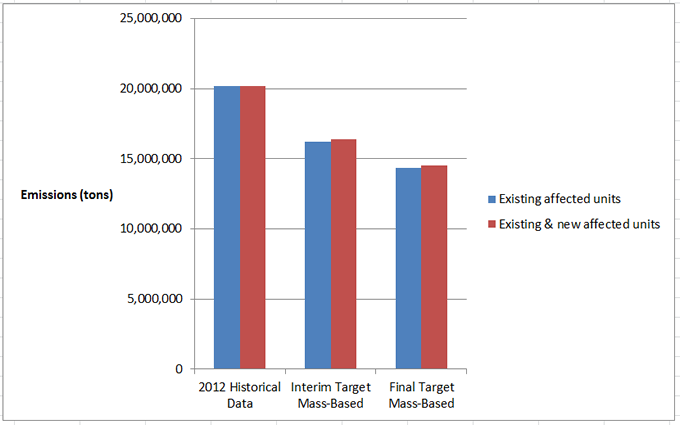 In Maryland, the baseline data from 2012 through the limited allowable emissions results in a reduction of 37%. Under RGGI, Maryland’s emissions will be reduced 17.5 million tons by 2020, a 25% reduction in annual GHG emissions by 2020, compared with 2006 levels. As of 2013, the State has reduced emissions by 9.7%. Maryland and its power plants will need to continue to work to reduce CO2 emissions and take additional action to reach its goal in 2030; these goals seem achievable. The CPP ensures that states and power plants can rely on the electricity system’s inherent flexibility and changes already underway in the power sector from socio-economic factors and other environmental and energy policy drivers. 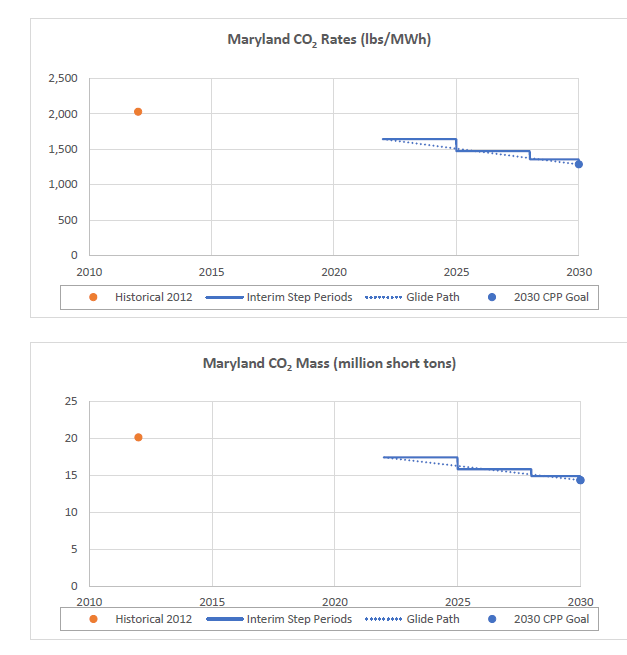 Figure 5-5 shows the expected CO2 emission rate reduction in lbs/MWh and the emission mass reduction in million short tons for Maryland. Both the “glide path” and “cliff” are identified in Figure 5-5. On February 9, 2016, the Supreme Court, in a 5-4 vote, stayed implementation of the CPP pending judicial review, in response to a legal challenge brought by a coalition of corporations and 27 states. The Court's order states that the stay will remain in place while the D.C. Circuit resolves the merits, and until the Supreme Court resolves any appeals. The D.C Circuit’s decision is expected in either winter or early spring, which means the Supreme Court could hear a merits appeal sometime in the fall of 2017, with a slight chance it could even be the spring of 2017. In addition to the rate-based and mass-based goals that states may choose, an alternative to the mass-based goal—mass-based state goal with a new source complement measured in total short tons of CO2—is available to implement the CPP standards. This includes the use of emission budget trading programs in a mass-based state plan for the RGGI participating states. States face a trade-off in their decision to include or exclude new sources. Mass-base compliance plans that cover new units would limit emissions from covered existing units as well as new units in the same categories. Including new units creates a uniform market signal for new and existing sources, which maintains a level playing field and strengthens the environmental integrity of the policy. It also sets limits on fossil generation, potentially limiting a state’s ability to meet load growth with fossil generation. Expectations about future load growth and the resources used to meet that growth are a key consideration in the choice of whether to cover new sources. Depending on how a state’s assumptions about future load growth and the resources needed to meet that growth compare with the EPA’s assumptions in calculating the mass-based budgets, including new sources could be harder or easier to comply. For example, if no new units are built, the new source complement provides additional allowances that would reduce the stringency of the regulation. For states that participate in interstate trading, including Maryland, affected units in the state could end up with additional allowances to sell or needing to purchase additional allowances. Some states may perceive that covering new sources imposes risk by limiting total future emissions, but doing so will likely increase electricity markets’ efficiency, states’ flexibility in allowance allocation, and emissions integrity, and it may increase the supply of allowances for existing sources. The new source complement for mass-based goals provides a slight increase in the existing mass-based goals for any new fossil-fuel power plants. The new source interim complement for Maryland is 170,930 tons of CO2 and the final mass-based goal complement is 150,809 tons of CO2. The addition of the new source complement mass-based goal increases the overall mass-based goal by only 1.1%. Figure 5-6 shows the interim and final mass-based emission limits for Maryland existing affected sources only and for existing and new affected sources that include the new source complement. Source: Federal Register Vol. 80 No. 205 October 23, 2015, 40 CFR §60 subpart UUUU. Adair, Sarah and David Hoppock. Policy Brief NI PB 15-06: New Sources and the Clean Power Plan; Considerations for Mass-Based Plan. Nicholas Institute for Environmental Policy Solutions, December 2015. Web. 17 March 2016.